In light of celebrating 20 years since the first edition of Harry Potter and the philosopher's stone was first published, I thought it was only appropriate to write this post. 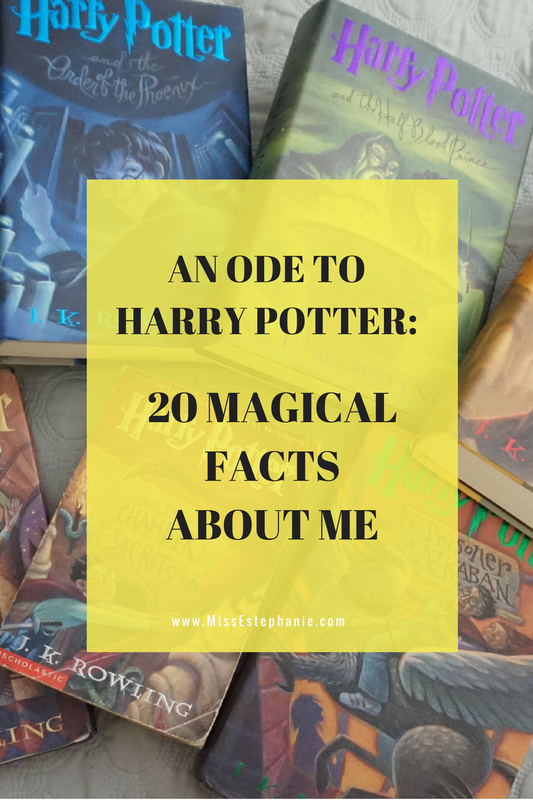 Here are 20 facts that you may or may not know about me relating to these books. 1. I first learned about the Harry Potter books in the 5th grade because our teacher made us read it. Needless to say, I have him to thank for my low-key obsession. 2. I remember that as soon as I finished the 1st one, I begged my mom to buy me the 2nd one. And we found it, at Marshalls! It's a paperback version and I still have it. All messed up and tattered..its that much more special to me. 4. I have an entire binder full of Harry Potter "fandom". And nope, not ashamed of it; I'm pretty proud of it actually. LOL. 5. I remember when I'd finish a book, I'd quickly start writing notes about it so I wouldn't forget the important details. I'm NOT kidding. I guess I blame myself for being an impulsive note taker for just about everything. 7. I've always felt a special connection toward the books. I'm sure if you're a fan you know what I am talking about. 8. I had (still have it) a harry potter stationary set, complete with parchment and envelopes AND stickers and I would write letters to Harry, Ron, and Hermione. I wish I could say I was kidding, but I'm not LOL. I'd even address it to them specifically. (I'll include some photos so you could laugh at me haha) . 9. I have all the books in hard cover except the 2nd one. I've always wanted to buy the 2nd one in hardcover but never did. It still kind of bothers me lol. 10. I've never gotten around to get myself a Harry Potter themed cake for my birthday. I've always wanted one! It'll happen someday. LOL. 11. If I ever get a tattoo, you could bet it'll be Harry Potter themed in some way. 12. The first time I visited the Wizarding World of Harry Potter in Orlando, I truly thought life couldn't get ANY better...I still feel like that every time I go back. It really is magical. 14. I pretty much lost it when I visited Kings Cross station in London. They have an entire Harry Potter themed store. You could also take photos outside as if you're heading to Platform 9 and 3/4 . Oh you know damn well know I took that photo and bought it. 15. I own all of the movies, but I still find it satisfying to watch them when they show them on TV...I can't be the only one, right? 16. I sometimes use the word, rubbish. 17. It hit me really hard when the last book was published, let alone the last film. I always looked forward to going and watching them at the movies. 18. Bertie Bott's every flavor bean are pretty nasty. I just bought them to keep the box. LOL. 19. I had a GIGANTIC crush on Tom Felton, the actor that played Draco Malfoy. I thought he was the hottest person, EVER. 20. I wasn't impressed when I first heard about HP and the cursed child, but when I finally did read it, the script itself is really good! And if you're a HP fan too, share some memories with me in the comments. PERFECT YELLOW MAXI DRESS FOR SUMMER !